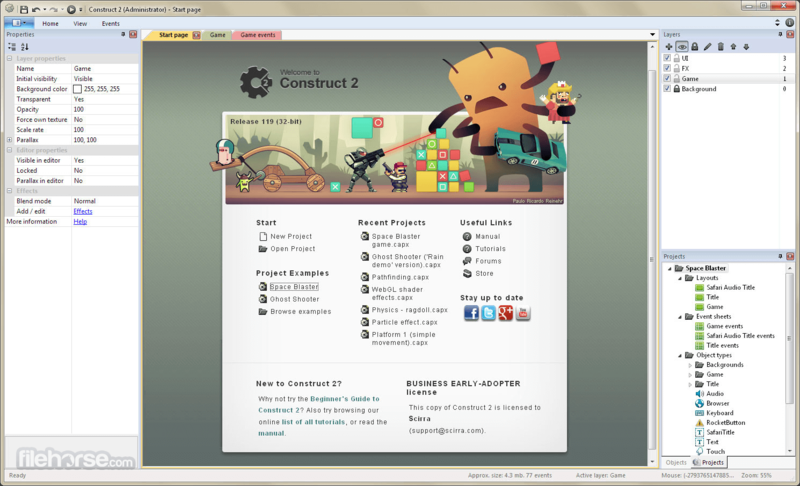 Construct 2 is a powerful ground breaking HTML5 game creator designed specifically for 2D games. It allows anyone to build games — no coding required! 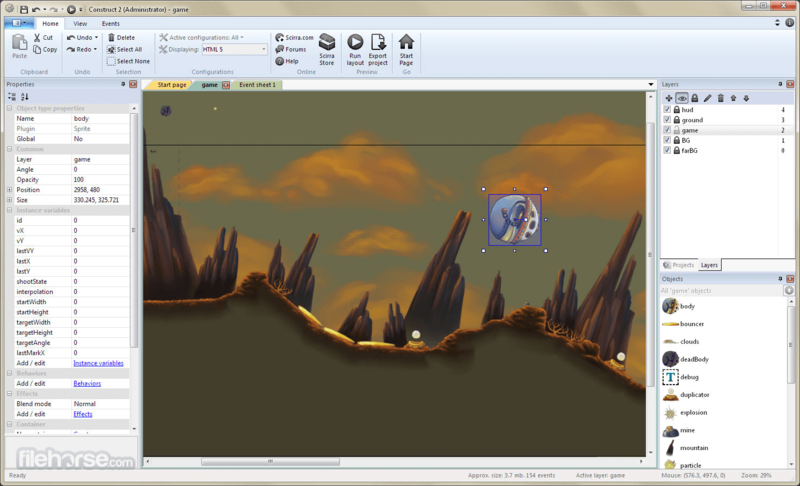 Use Construct 2 to enter the world of game creation. Teach the principles of programming in a fun and engaging way. Produce games without having to learn difficult languages. Rapidly create mockups and prototypes, or use it as a faster alternative to coding. Bring your work to life in hours and days instead of weeks and months. 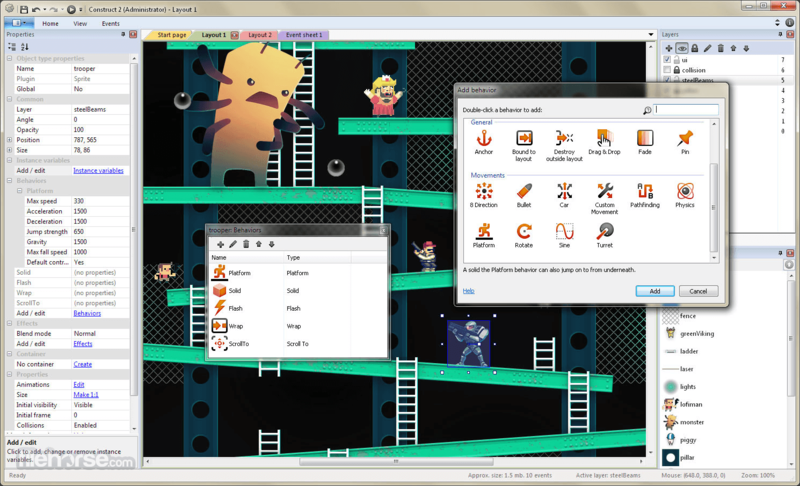 With Construct 2 making games is a piece of cake: just drag and drop objects around, add behaviors to them, and make everything come alive with events!With a quick and easy to grasp Ribbon interface, you have clear access to a wide set of tools that allows anyone to jump into game creation with little to no prior game development knowledge. Make your game do what it needs to do in a visual and human readable way with the powerful Event System. There’s no need to memorize complicated and cryptic languages. With events programming becomes intuitive putting your focus on what really matters: designing your game! 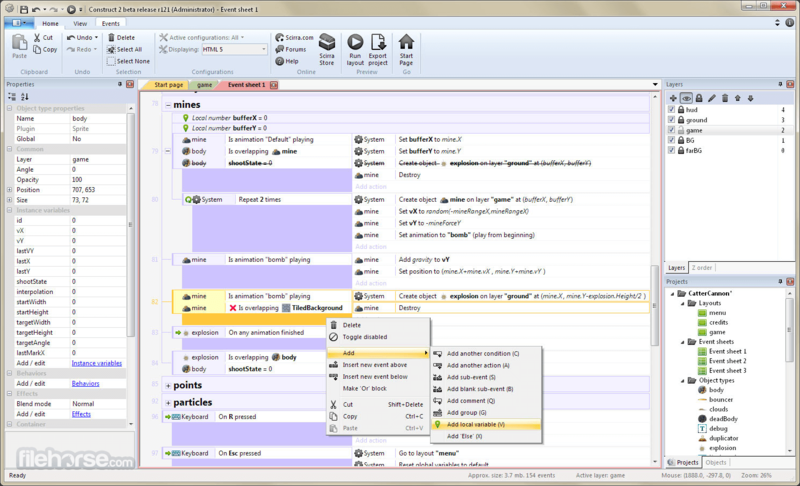 Events are created by selecting possible conditions and actions from an organized list. The result list of events, or Event Sheet, is designed to be as easily readable as possible, so that beginners can get instant results as well. Entire event sheets can be re-used by other levels, saving you re-creating events for other levels. Behaviors work as pre-packaged functions that you can assign to objects and reuse whenever needed. They provide an instant way to add capabilities to objects, speeding up development and increasing productivity. They include movements such as 8 directions, platform, and car; advanced features like physics and pathfinding; and useful utilities like fade, flash, wrap, pin and drag & drop. Most behaviors can be replicated with events, but it simply is far more time consuming to do so. That’s why behaviors can be great time savers, without limiting what's possible when you need to go further. Publish your games on a broad selection of platforms with a single project. There’s no need to maintain multiple codebases. 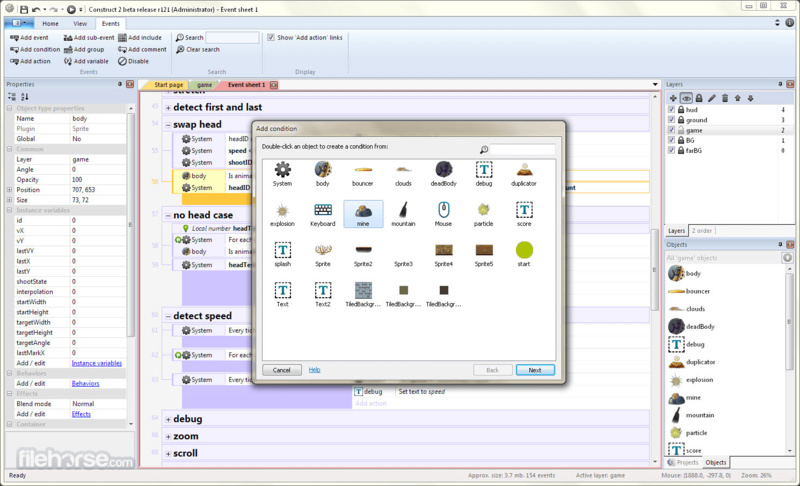 By using Construct 2's HTML5-based engine you can export to most major platforms. Easily reach the web by publishing to your own website, Chrome Web Store, Facebook, Kongregate, NewGrounds, Firefox Marketplace or use our Scirra Arcade to share your creations. Export your game to desktop PC, Mac and Linux apps by using the Node-Webkit wrapper. Additionally publish to Windows 8 Store or as a native Windows Phone 8 app.